I just love Carrie Wilkerson so I was excited to read her newest book “The Barefoot Executive”.This dynamo has 4 kids, 3 businesses and is just a ball of fire. She also has a lot to teach us about building a successful business. Carrie is actually relatively new to internet marketing having only been in it for just a few years. But by taking massive action on a consistent basis, she has grown her income to 7 figures in those few short years. your focus so you come up with a winning idea. Carrie is quick to point out that there is no “magic button” you can push for success. She is the first one to tell you hat without massive action, your will only get ordinary results. But she does provide not only a formula to follow, but heaps of encouragement along the way. What Should My Business Look Like? You will also learn about multiple streams of income and how to grow your audience and your business. I loved this book. 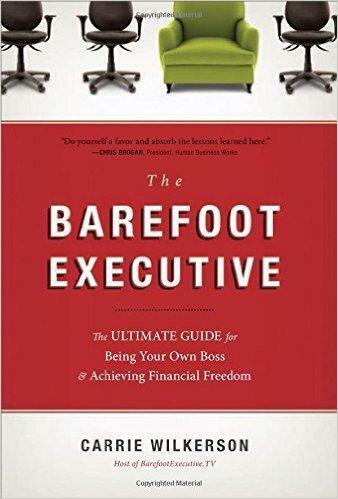 So many people work from home these days, the term “Barefoot Executive” applies to men and women all over the country.